Do not argue or engage with any person who has very little or no control of his mental faculties, and who has been suffering from insanity for sometime. Pray for him instead. We were the world and the love that was everywhere was coming from us and spreading to every space. It was a blessed moment. I have been traveling or 16 days now. I have been on the road with nine women who are all past 60 years old. My sister-in-law Rosanne had invited Lydia on this tour. Lydia had been convincing me to go. I wasn’t sure I would enjoy being with nine other women but I finally said yes about three months ago. I was the last to sign up. Actually, I am quite glad I did. It is fun to travel with women who have strong caring instincts. Often, I feel that they are looking out for me. 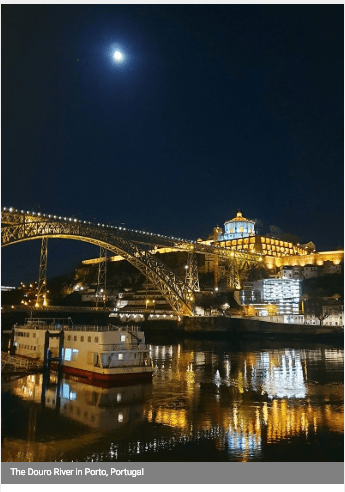 The first leg of this travel was eight days in Portugal, a beautiful country — very picturesque, quite affordable with very nice people and tons of history. 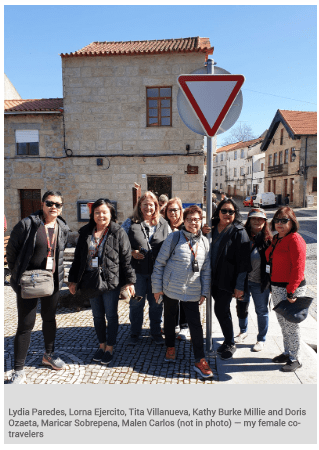 The 10 of us arrived in Lisbon and wasted no time enjoying the food, the sights, and going around for two days even before the tour we signed up for started. When the tour formally started, we all hopped on a bus, this time with other tourists from South Africa, the US, Ukraine, etc. and visited many cities like Porto, Viseu, Belmonte, Evora, and many others. We spent a lot of time visiting chapels, churches, Basilicas, fortresses, museums, shops, universities, wineries, monuments, while enjoying sunny Portugal’s great weather. Our seasoned tour guide, Pedro Graca, a native of Portugal, proudly introduced us to the many wonderful things that his country can offer. I’ve always loved history. As a Filipino, I knew a little about Spanish history and how we were colonized. And it was so fascinating to hear and see how this Portugal, which was once a great superpower that rivaled Spain, went through its own history. Most amazing of all was knowing about Portugal’s heroes like Vasco De Gama, their kings, poets and writers from past centuries and how they are still so relevant and much part of their society today. I have made a promise to myself to visit Portugal again and stay longer. I am in Paris as I write this. I have been here before. I spent Christmas here in 2017 to visit my daughter Erica and my grandchild Ananda. Paris is a very charming city. One can say that it is one of Europe’s most beautiful, scintillating and exciting destinations. No wonder so many people love Paris. Paris is a world center. If anything is happening here in the arts, fashion, the world of ideas and politics, it affects the rest of Europe and perhaps the world. Today, I watched the Van Gogh presentation at D’Atelier D’Lumiere. It was an immersive experience of Van Gogh’s paintings projected in many huge walls and even the floor. The paintings projected everywhere moved, blended and bled into each other. Truly mesmerizing. The audience was part of it. I would say it was the best thing I have seen on this trip so far. 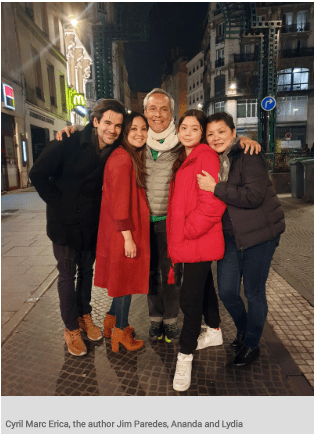 After the exhibit, we ate at Robuchon, a famous one-star Michelin restaurant that my daughter Erica trained in as a chef after her stint at Cordon Bleu. It is the second time I have eaten there. The appetizer (amuse bouche) was made of foie gras, and some other ingredients put into a very small glass. It is meant to excite the palate before the entrees are served. To put it mildly, it was spectacular. It left us talking about how wonderful it was for the next 10 minutes. Robuchon is an expensive place to eat. But if you want the true French experience in dining, you must eat in all kinds of restaurants from the cheap to the expensive to savor a good representation of French cuisine. I am quite amazed how my apo Ananda can now speak fluent French after 10 months of classes. I heard her in conversation and she seemed quite eloquent. Her pronunciation and vocabulary are pretty good, according to Cyrille, Erica’s partner. She will be transferring to a regular school soon. Am happy that she has adjusted quite well. During travels, I find myself being both a participant and spectator at the same time. As participant, I get into the food, enjoy the sights, the experience. I soak in as much as I can. As a spectator, I try to analyze and look for commonalities with my own background and culture. Sometimes, I go way more than that. A while ago as I waited in line to get into the Van Gogh exposition, I felt surrounded by “foreigness” everywhere. I was actually not uneasy. I just noticed how much diversity there was. There were people of different colors, nationalities, ethnicities who spoke languages from everywhere. I marveled at how colorful humanity is and how easily everyone can now experience cultures beyond their specific origins. As much as there was diversity, there were also a lot of shared commonalities like art, food, fashion, music, etc. I noticed an American family beside me in line comprised of a dad, a mom, a daughter and a special child who was in a big stroller. I noticed how lovingly the family attended to the young boy who was in quite good spirits. He smiled a lot at me. I suddenly had an epiphany. I was moved at how this family loved the special child so much. I was getting quite emotional at how much they affectionately attended to him. Then something suddenly crept all over me. It permeated my whole being. From the boy’s smile, I felt love emanating that seemed to fill the whole space we shared. I was touched to the core. It was such a great Zen moment. I felt that at that instant, our individual origins did not seem to matter. We were humans that became indistinguishable from each other. We were the world and the love that was everywhere was coming from us and spreading to every space. It was a blessed moment. It seemed like time stood still. I took it all in. I know I was awake because I still felt the pain on m legs caused by days of walking. Everything around me, every feeling, including the physical pain there but wrapped in love. I smiled and thanked God for that moment. I still have a few days here before I head home. There is still so much to see and experience. But I do not feel frantic or anything. What you can experience depends so much on the state of conscious awareness you can muster. You can be in the most beautiful places in the world and still have a lousy time if you can’t take it in with the right attitude. By the same token, awareness can make the most mundane places an extraordinary experience if you pay full attention to them and how you are processing everything. Like everything of value in life, there is an art to it that one must learn. I am glad that I have learned enough about the art of traveling and I am enjoying it now more than ever. 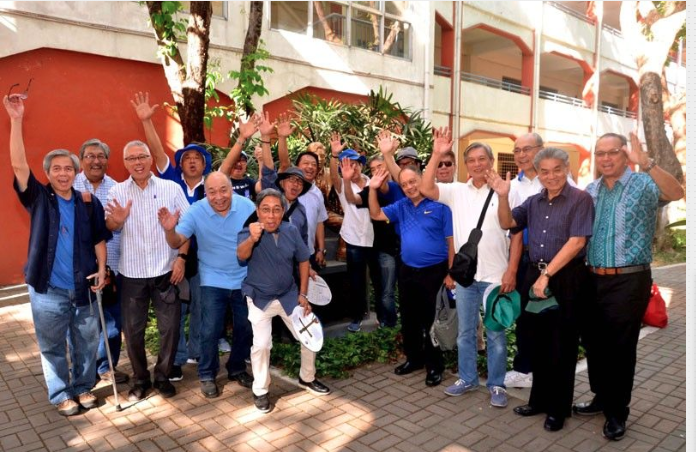 It will only happen once in our lifetime.” That was the mindset we all had when Ateneo de Manila Class 69 gathered last Saturday, March 9, to celebrate our 50th year since graduating high school. Many classmates came home from abroad, some of them two weeks early. Before the actual night of the grand celebration, there were individual class section meet-ups and get-togethers for lunches, dinners, golf, outings, etc. Classmates who had settled and built lives in Davao invited their Manila and overseas classmates to spend a few days there to party and bond and have a great time. There were also the one-day excursions to Pampanga arranged by Tito Panlilio and at Sandy Javier’s farm in Rosario, Batangas. High school class ’69 had seven sections. My section was 4E when I was a senior, although I spent the first three years of high school with another batch. Thus, I had the distinct pleasure to be part of two classes. My old 4E group and class 4F, which was my section when I graduated. It’s an understatement to say we were all quite excited to see each other since the past three years had driven home the point to us that we were all aging faster than we thought. Quite a few in our class have succumbed to strokes, heart attacks and other sicknesses that required expensive hospitalization. It was beyond wonderful to know that many had generously contributed to gather funds to help those in need. Our classmate Joey Zuniga also passed away last year. We are all aware now that time is indeed moving faster at this stage of our lives. All this bonding intensified when we formed a Viber group almost two years ago. A lot of classmates came on board and friendships were revitalized. Everyone got to hear and reconnect with everyone else. Since then, there have been a daily-dose jokes exchanged, prayers and spiritual insights shared. Another Viber group we formed is reserved for political discussions. March 9 was a busy day. Some classmates gathered as early as 3 p.m. to visit the old high school. At 5 p.m. we gathered at the Singson Hall at the Grade School to attend Mass officiated by two classmates Fr. Bingo Nespral of Opus Dei, Fr. Ben Alforque of the Missionaries of the Sacred Heart, and Fr. Norberto “Kit” Bautista S.J. Fr. Bingo gave a light, nostalgic, humorous sermon. He ended it by saying that love for each other brought us together. After the Mass, Ed Garcia, our former teacher, friend, guide, organizer and spiritual adviser in high school gave a short talk about how special our class was. He ended it by asking us to choose three classmates to thank for being part of our lives. All of us started thanking and hugging practically every person in the room. Many of us brought our wives, and some came with their new partners in life. After brief introductions, most of the girls gathered together and left us boys alone to talk and laugh as we reminisced about the good old days. Old nicknames and jokes resurfaced. Stories of shenanigans, and crazy stuff and “initiations of passage” were shared amid loud raucous laughter. There were also serious conversations about how our lives had turned out through the years. Boboy and I were the special guests tasked to entertain. We were not surprised that many of our classmates had never seen us perform live. We teased them that they never watched us because none of them wanted to pay to watch old classmates sing. We prepared a repertoire that showcased what 50 years of APO was all about. I think we amazed them. All night, classmates congratulated us for the 45-minute gig we did. Two bands played the night away. The Flintstones and The Mixed Emotions had us dancing all night. Eddieboy Rodriguez, a classmate who became a doctor, played the guitar, drums and percussion and sang with The Mixed Emotions while Malu Fernando played drums for The Flintstones, a band he had formed many years ago. It was amazing to hear them play. I thought of how therapeutic it must be for them to still being engaged in their passion for music at age 67. I know, because I am still pursuing my passions. We all sang the old songs with passion and gusto. We shouted the lyrics out loud as we danced and drank and laughed. Wave upon wave of nostalgia flooded over us — memories of old girlfriends, proms, parties, carefree days of youth, high school life, teachers, special school events, class nights, the awkward teen years, pranks we did on each other — it all inundated us even as we were regaling. It was a magical experience. We felt like we were briefly back in our mostly happy place on the Loyola grounds where we felt the exuberance, strength and invincibility of youth. Even as we were going through some growing pains then, we understood very little of life and the world. Innocence was, indeed, bliss. We ended the night with warm goodbyes, hugs, carrying our loot bags as we jokingly promised not to wait another 50 years before we saw each other again. The organizers — Greg Cancio, Ed Santos, Tito Panlilio, Monchito Roco, Dodie Limcaoco, Jess Birosel and many more — did a great job. We thanked them profusely. Maybe we should also thank everyone who came for making the night a truly amazing one. As our batch president Greg said, it was a group effort. I would like to end this by going back to a valedictory speech given by Dr. Tony Dans to a high school class at ADMU a few years back. He told the graduates that many of their high school friends would be playing important roles in their future lives. From their batch, they will find doctors who will take care of them, lawyers who will defend them, professionals they will consult for many things. There will also be classmates who will be living in other parts of the world who will house and feed them when they visit. They will also find friends who will walk with them through the dark tunnel of personal struggles. These friends will go through the darkness while cheering you on all the way. This is so true. We are all connected in more ways than we imagined we would. Ralph Waldo Emerson said that, “It is one of the blessings of old friends that you can afford to be stupid with them.” Whatever our failures in life will matter little to those who love us. Were we not surprised that night, how easily we picked up where we had left off, even after decades of not seeing one another? We were young pups when we were in school. Now we are old dogs, but not old enough to stop playing, running and discovering new playgrounds. And we will always be a comfort to each other. Last Friday was International Women’s Day all over the world. I have lately been thinking of all the women that have somehow affected me and shaped me as a man. They have inspired me, broken my heart, served me, enslaved me emotionally, hurt me as I have hurt them, seduced me and pleased me as I have done with them, taken care of me, raised me, intimidated me, taught me life lessons only women can teach, educated me, refined me, shaped much of my values, and elevated my tastes in many ways. For all of the above and more, I admire and adore women. And I salute them. My mother Ester Misa gave life to me. She had 10 children. I was the ninth. She was a beautiful mestiza who knew how to take charge. She was both soft and hard. Her embrace and reassuring words were more than enough to make me feel all was right with the world. To a son, a mother’s love is the most wonderful thing there is. Mom was a teacher, protector, nurturer, and the hearth of all things reassuring and beautiful. At the same time, she was tough when it came to defining moral character, which she wanted to instill in us. She was extremely honest, responsible and modeled adulthood in the best possible way. She showed courage of conviction, forgiveness, compassion, extreme generosity with the little resources that she had. She took in strangers who needed help. She had very few vanities. She was very practical and strict at the same time. I once wrote a song called Basic Love that was about her. I described her as uncomplicated, straight-talking and pure. What you saw was what you got. Our yaya, Ustang Baje, a sweet, caring, loving Ilocana from Abra, Bangued who liked to smoke cigars, attended to us sibs when we were kids. She cooked for us, bathed us, and kept us close to her so we stayed within her orbit of safety. She told us stories. She loved to laugh out loud. As a young boy, the smell of Vicks and cigars defined her reassuring presence to me. I remember sleeping beside her in a banig, and just being beside her was such comfort. She was pure love. The woman I married is Lydia Mabanta. We dated, and fell in love even before we knew it. When she left for the US to study, I thought my world would fall apart. I called her by phone and asked her to come home to marry me. She was 20 years old and I was 25 when we marched down the altar 42 years ago. We have grown together and I must say that a great lot of what I know about how a woman thinks and feels I learned from her. She continues to both baffle and thrill me to this day. She is both yin and yang. For men, marriage is a life-long course on understanding, loving and appreciating a woman. In a big sense, it is a man’s surrender to fate. Through thick and thin, for richer or poorer till death do us part. Amen. Lydia is my wife, companion and partner for life. She is loving, caring and a great mom and lola. We have experienced the whole spectrum of emotions together and have been each other’s teacher. We love, laugh, cry, fight, and continue on the path we took decades ago. Oftentimes, when I look back at fights we have had, I liken it to sandpaper that we apply on each other to smoothen our rough edges into something more defined and more beautiful. I have four sisters — Babsy, Tictac, Meiling and Lory. They are all older than I am. From them, I learned a lot about young women. I saw young men visit and court them. I witnessed them having boyfriends and from them I learned how they wanted to be treated. I’ve seen men appreciate them and also break their hearts. It was educational for me to hear their points of view about what made someone a good man or woman. Everything I heard from them taught me to respect all kinds of women, whatever they were or where they came from. Sexism had no place in our family. I have had women teachers who taught me well and helped me discover talents I never knew I had. I remember Miss Sandoval, my teacher in Grade 4. She chose me to represent the class in an elocution contest. I was initially mortified. I had no confidence at all. Daily, she taught me how to deliver the piece with the right enunciation, subtext and force. I ended up winning first prize, much to my surprise and delight. There is nothing more encouraging when a woman believes in you. It was life changing. To the girlfriends I loved and who loved me back, to those who broke my heart, I learned how to be brave and risk loving and when the time came, face the pain and recover from the loss. I actually learned a lot about myself. I couldn’t have been the man I became without having my heart broken a few times. I have two daughters who are now mothers. They gave me much to worry about when they were growing up in a world that was changing too fast. I raised them without a rear-view mirror. I did not know then if I was too liberal with them. Much to my relief, they have grown to be beautiful, wonderful, independent and strong women. I know they will impact the world in their own ways. Women hold up half of the world and yet they are underpaid, abused and disrespected many times. To all the women of all shapes, sizes, sexual preferences and races all over the world, let me express my deep respect, love, admiration and gratitude for being the more loving and enlightened half of humanity. I am with you in your march to equality and liberation. It is very possible that, as a man, I may never really understand the depth of women’s pain, their thinking process, the phases they go through as human beings and everything else unique about them. I am 67. My education about women continues and will never stop. And that’s how it should be. In my life, my muses have been mostly women. They are Goddesses in my life that keep me inspired, fascinated and forever creative. I can only be eternally grateful. It was a Viber message from out of the blue. Totally unexpected, an old friend Eric Ingles contacted people he shared a stage with in high school for a cast reunion of Doon Po Sa Amin, a play by Onofre Pagsanjan. It was a theater presentation of the very first batch of Dulaang Sibol, Ateneo de Manila’s well-known high school drama group. Eric wanted to organize a reunion. The play, a “transplantation” of American playwright Thornton Wilder’s Our Town, was our first real experience with performance and acting. It ran for many shows and it was reviewed quite well. It had been 50 years since we performed it in high school. This play was special to us. We were just teenagers then. 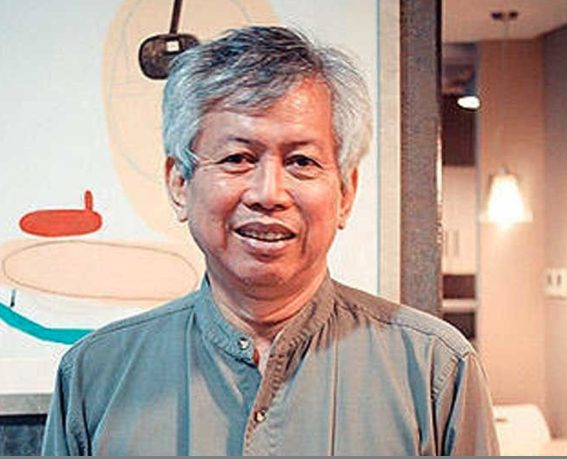 Writer, director and mentor Onofre Pagsanjan opened our eyes to things we did not know we were capable of doing. It was as if he made us discover the creative powers that were inside us. He taught us how to express ourselves beyond our shyness and angst that we suffered from as teens. Mr. Pagsi, as almost every Atenean fondly calls him, was a big influence on the lives of many, including our own. To us, he was an inspirational teacher, a role model of what a good adult should be. He knew how to listen and he understood where we were coming from. He was kind and patient, but firm. He made learning a fascinating, exciting endeavor. He believed in us and drew from us the best we could do. He made us believe in ourselves. Many great things happened because of Doon Po Sa Amin that affected how we, the members of the cast, all turned out as adults. Six members of the cast actually met there and married each other, and are very happy to this day. From the cast came some members of the original Apolinario Mabini Hiking Society, and we know how that turned out. Life-long friendships were also formed and are being nurtured to this day. So when we got Eric’s Viber message calling for a reunion, we were all excited. One by one, cast members responded to the invitation, using their characters’ names in the play. Some took awhile to respond because we had lost contact with them. But thanks to social media, a majority were found. Except for those who had passed on and some who were living in the US, we were almost complete. Mr. Pagsi and his wife Florin were there early. He was 41 years old when he mentored us. Now he is 91. I sat with him and he told me how much he enjoyed watching the Eto Na! MusicalnAPO presentation at Maybank Theater. He was proud of us. With a twinkle in his eye, he said he was amazed at how many songs we had written for APO, which, in his opinion, had defined OPM in a big way. I felt proud. Soon after dinner, I started playing the guitar and everyone started to sing the songs we used to sing in the play. We went through many ’70s songs and even older ones. We sang with glee and with full hearts. With every song, Pagsi and his wife sang with us. Sometimes he had his eyes closed as he reminisced on the memories that must have flooded over him. When we sang the song, I Believe, I saw him close his eyes, move his hands and sing with such great feeling that all of us noticed it. He was lost in the moment. It was something we will remember forever. Amid the singing he was expressing to me how he was “drunk with song” and how happy he was to be with us. Eric asked him what their theme song was. It was the song, I’ll Be Loving You. We sang it while they held hands. Actually, they were holding hands all night. To see old friends and people you spent some of your formative years with was quite special. Here we were, 50 years later, away from our early teens, enjoying like we were young again. We had built careers, had partners, families and lived our own individual lives. Alben Bartolome who played the role of the storyteller in the play brought a copy of the old script. Instantly, we were back in high school reciting lines from the play and reliving memories. I swear, 50 years seemed to have passed by in a blink. 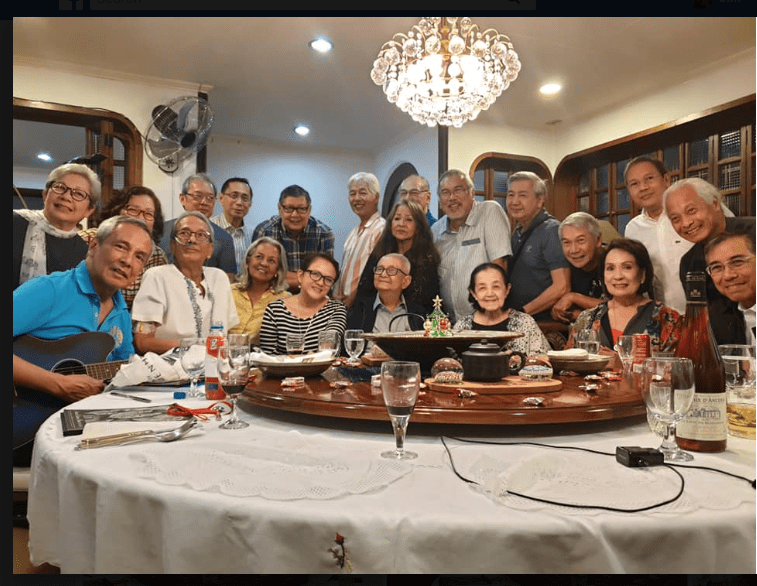 After more than three hours of singing, laughing, joking around and just having a great time, Gus Cosio stood up and thanked Pagsi for not only teaching us a lot of things but also raising us with the values we live by today. He spoke for all of us. Pagsi expressed gratitude for the dinner, the great camaraderie and the music. He hugged each one of us. We went home happy and nostalgic but mostly thankful that we all had shared a brief moment 50 years ago that affected our lives positively to this day. It was great to see our old teacher, director and mentor again. He had affected our lives in very positive ways, more than he will ever know. As I said goodbye, I hugged him and said a quiet prayer. 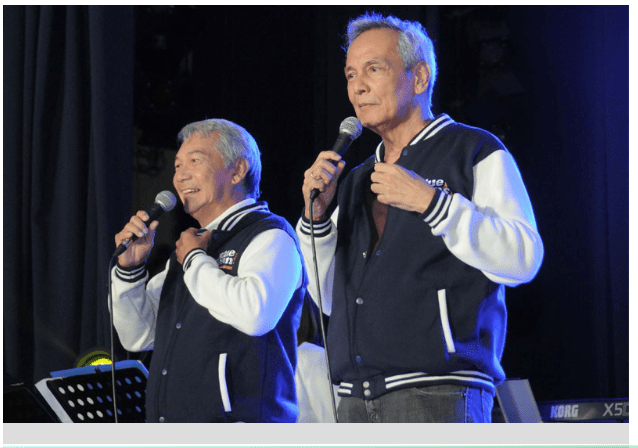 I tried to imagine what life would have been like if we did not audition for Doon Po Sa Amin 50 years ago. Unimaginable! I can only say thank you to God for the breaks he gave me early on. Present that evening were Lito De Joya, Chito and Dianne Kintanar, Sonny and Ruthie Santiago, Gus Cosio, Alben Bartolome, Gigi Escalante, Boboy and Bong Garrovillo, Tato and Edna Garcia, Claudine Zialcita, Butch and Betta Dans, Eric and Doga Ingles, Aton Atilano, Tito and Sabrina Panlilio, Greg and Paulette Cancio, Junjun and Cecil Dayrit, Lory Paredes Tangonan, Lydia and myself. P.S. 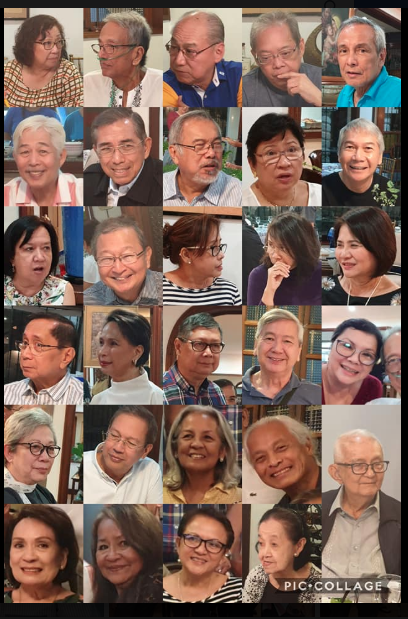 : On March 9, Class ‘69 of Ateneo de Manila High School will have a Golden Jubilee grand reunion at the Mariano Singson Hall at the Grade School. Days before that, each classroom will have their own get-togethers. There will also be an out-of-town excursion planned for everyone who can come. I posted something on Twitter and FB last Thursday that got a lot of attention. Many people liked, commented and forwarded the message. But there were also reactions that were mixed. Some were intrigued, baffled. Two expressed that it was a waste of time. One questioned my motives. Many thought it was a cool idea. What was clear was many people read it, thought about it and somehow resonated with the idea. It seems practically every Filipino anywhere in the world has had the sad experience of losing friends and not talking to family members because of disagreements about politics. The polarization has become too much. For many, the line has been drawn. It has become a “them versus us” situation. Rational discussions on politics are now so hard to come by. Real facts have been drowned by so much fake news that people have lost their trust in the usual credible sources. Reason is under attack. Things have become too emotional so that people seek validation not from facts but from kindred spirits who share their opinions and feelings whether fact-based or not. No wonder a post like the one above generated excitement among my followers. Many people want their old lives back where they could just hang around with friends and family and talk about anything and everything. That has become quite difficult now. But it is still possible, under certain conditions. I know of some Viber groups that have rules discouraging discussions about politics and religion. Basically, one can talk and express anything as long as you don’t touch on these two topics. In my ADMU Class Viber group, it has become the norm. Religion is okay, but politics is not. In fact, we had to make another Viber group for those who want to discuss politics just to make sure the conversation is not forced on anyone and no one gets turned off and leaves the group. I am planning the first coffee meeting that I suggested above. It should be soon. It will be in a public place. People can simply show up. No need to identify themselves based on political beliefs or affiliation. That limits the person in the eyes of others. He becomes just that to some, even if we are really much bigger than that. The idea is to be able to appreciate everyone as individual, fellow human beings. Everyone has dreams, ideals, wants, desires and goals. There are also a million things to talk about that do not have to necessarily arouse people and make them defensive, offensive, or toxic. The world is filled with wonderful things to appreciate and talk about. There are so many topics to chat about, and experiences we can individually share that can inspire and enrich others intellectually, emotionally and even spiritually. The aim is not to convert anyone to any cause but to see people in as many contexts as possible. More than being just labeled as Dilawan or DDS, let’s look at everyone as who they are. They could be parents, students, etc. who have something to share. They are people like us who also worry about the future. They love others and are loved back. We are certainly more than just political statistics. As humans we are multi-faceted, multi-talented, and open-ended. When we open ourselves to others and vice versa, we begin to look at them with greater understanding, empathy and perhaps even with respect. But many tough questions can arise within us that can stop us in our tracks. One of them is: Can you actually make peace with someone who is truly despicable? I have sat and listened and talked with killers, plunderers, some evil people. Some of them are well known public figures. Let me tell you, I had to stretch myself to try and understand where they were coming from. Some are difficult to understand. They aroused no empathy in me. One of them actually espoused values like respect for human rights, anti-corruption, anti-violence even if he has a private army and has had people killed. But some of them were actually quite charming and even charismatic. You may even get to like them in some ways. What I learned from those meetings and chats is that you can have greater understanding of people without losing your own values. In many ways, being exposed to them can solidify your own values and beliefs more, even as you take pity on them. If anything, I’ve learned that human nature is not simple. It demands a great openness to try to even understand it. Psychologist Carl Jung said that when two people meet, a chemical reaction happens that leaves both of them changed. For sure, many of us have met people with bad intentions that have left us fearful, and even forced us to be quiet. But some of us have also met strangers who have inspired us to have more trust and faith in humanity. Invite fellow Filipinos who do not agree with you out for coffee. Even if you exclude politics in the discussion, there are still many things to talk about. It would not hurt to reach out to the “enemy” and do the extra effort of listening and interacting with them. Who knows, maybe both “them” and “us” can become more human in each other’s eyes. Tell jokes. Share life stories. Discuss what you are passionate about, etc. Maybe even do karaoke. Those can be steps (however small) towards healing. It was a night that around 500 people will remember for a long time. I’m talking about the night of Feb. 10 at the Maybank Performing Arts Theater at BGC. 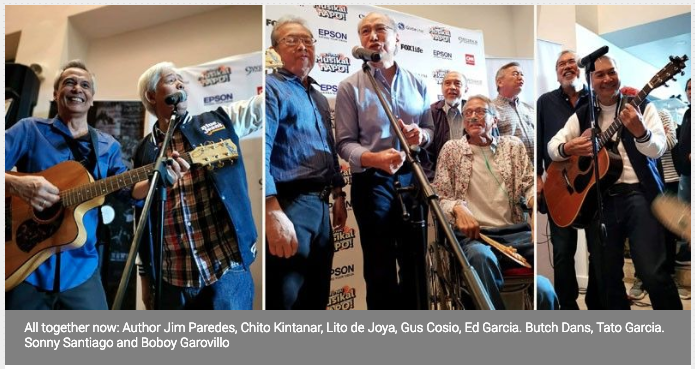 Boboy Garrovillo, Sonny Santiago, Tato Garcia, Gus Cosio, Lito de Joya, Chito Kintanar and I — all original APO members in college — got together and bought a night of performance of Eto Na! MusikalnAPO, the hit musical. We did this to raise funds for fellow APO member Butch Dans who is sick with Chronic Obstructive Pulmonary Disease (COPD). He was a heavy smoker for decades. We planned this three months ago in 2018. I was told by Santi Santamaria, head honcho of 9Works (which produced the musical), that it would have a rerun in February 2019. We immediately reserved a night. We went all-out and called friends, friends of friends, relatives, classmates, fans; we put out the message on Facebook, Twitter and Instagram. Soon enough, we sold the bulk of the tickets pretty fast. Everyone was supportive of the cause. To be sure, the musical was not a hard sell. It was already on its second run. During the first run last August, it mostly ran full house and got a standing ovation every show. It was no surprise, then, that when we started selling, people responded positively. We wanted the night to be different from all the other showings. We had cocktails. We served delicious canapés and Bay of Gold tuna and salmon on crackers. We also had wine. We decided early on that we wanted to offer some kind of a surprise to the audience. We planned on getting the original APO members to sing two songs in the lobby during intermission. It got us all excited. A few days before the show, we met to practice the numbers we used to sing as a big group then. All in all, 12 people have come and gone from APO over the years, some for just a short time. Two songs we often sang then were There is a Meeting, by Joe and Eddie, and In the Still of the Night by the Four Tops. During rehearsals, memories of high school and college came flooding in. All of a sudden, it seemed we were not in our 60s, age-wise, but back in our teenage years. We were young, full of energy and noisy. We were teasing each other, as we used to then. We were smiling, even giggling during practice as we recalled stories of gigs, and crazy times in high school and early college. As the cliché line goes, it seemed like only yesterday. With older, somewhat untrained voices now, we mostly could not sing the songs in their original key. They were too high. Boboy and I were the guitarists and we had to make adjustments by lowering the key from A to G. It was still high, but it was more manageable. Lydia Paredes (right) and the crowd react. We practiced on and off for about a two hours, in between laughter and stories. A day before the show, my daughter Ala arrived from Sydney to watch. On the day of the show, we came in early and ran through the songs two more times. The audience showed up early to enjoy the cocktails. There were video screens in the room showing a collage of early APO photos. On the spur of the moment, we decided to sing then and there, instead of waiting for intermission, since the people were already gathered in one place. Butch Dans, who was not confirmed to show up, was suddenly there. We plugged in the mics and guitars and started singing. Right from the start, the people gathered and sang with us. They shouted out comments, laughed at our jokes, and relished a few stories that we narrated. The gig went quite well despite the technical difficulties with mics and guitars. We were ecstatic. The people who watched were all smiles. Many were remembering their own youthful days. Some were watching us for the first time and were quite moved by the love we had for Butch and for the warm camaraderie we all shared. Soon after, we entered the theater with the rest of the crowd to watch the show. Everyone was unbelievably high. The members of the cast were so hyped up because the original APO members were present in the audience. They knew they were portraying our story, however loosely, and singing songs we had made. They wanted to give 150 percent effort. It was my 14th time to watch the musical. Let me tell you, the cast was at their best. Everything went well. No hitches. The young performers were sharp as knives. Every joke was delivered well, every note played and sung beautifully with much feeling. The audience laughed their hearts out, and cried, too. Eto Na! MusicalnAPO has that effect on people. Ala was in tears throughout. She was so glad she came home. The songs in the musical had been part of her entire life. She heard many of them being composed at home, and played as records, sung on TV and at countless concerts. The love and the good feeling was everywhere. The more the audience showed appreciation, the more the cast showed its energy and talent. It was symbiotic. Everyone was soaking in a feeling of pure joy. Surely, Marie Kondo would find nothing to throw away that night. The cast got a standing ovation amid lusty applause. During curtain call, they pulled us up to the stage to take our bows with them. After bowing, Boboy and I thanked everyone for their support. 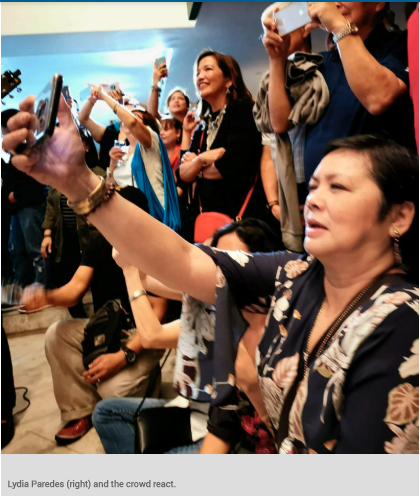 The joy spilled out into the lobby as the audience took selfies with the cast and the original APOs. People stayed to share their reactions, to connect, and to just feel the good vibes. We went home high, joyful, ecstatic, thankful that the Universe had smiled upon everyone who was there. Truly, an unforgettable night for everyone.